Waking up every day isn’t a choice but an unwanted duty. Some people need a gentle tap on their shoulder to open their eyes while there are people who can snooze over drums and trumpets. In both cases, cell phone alarms don’t seem to be reliable and the traditional alarm clocks are way too simple to understand your needs. The 21st-century Digital Alarm Clocks in such a case are packed with a number of features; very accurate, handy and convenient. Imagine an alarm clock that wakes you up with color changing lights, plays your favorite music and shakes your bed. Yes, all of this in one alarm clock. Have a look at some of such digital alarm clocks that will redefine your mornings and help you be punctual. This alarm clock is definitely made for the lazy sleepers. It comes with a 12/24 hour time-zone; super loud sound and shaker that will make sure you jump out of the bed in the first time. The Sonic Alert SBB500SS is a bomb with an extra loud dual alarm, built-in pulsating lights and adjustable volume/ tone so making it multifunctional and versatile. To give you a clear view, the clock has a large LED screen with a red display that is visible even at night. It also features a bed shaker that can be placed on the bed or under the pillow. It’s powerful and will vibrate your bed so hard without making a noise that you would end up getting out of your bed. Also if you don’t like those boring slow alarm clocks, Sonic Bomb is available in seven different colors to give your room the right contrast. Imagine the first thing you see when you wake up from the alarm is a projection clock, bold and clear telling you will be late, that’s Electrohome Projection Alarm Clock. 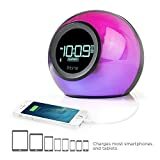 A clock with 180-degrees swivel projection, a 3.6” Blue light LCD display screen and brightening adjustments, this clock is easy to set-up and also very durable, meant to last long. Alongside the regular alarm clocks with snooze, nap and sleep features, Electrohome also instils a built-in buzzer and FM radio that can be synced with your iPhone, iPad and other Android devices. With Electrohome EAAC601 Projection Alarm Clock, reliability and accuracy is not a doubt. In case of a power outage, you don’t need to set-up the time manually, its built-in Advanced SelfSet technology will automatically adjust the time as per your zone. What more would you ask from an alarm clock if it comes with a wake-up light, radio and sunrise simulation? Yes, all of this is in Philips Wake-up light alarm clock. Designed to make you get up from bed comfortably and in a smooth transition, this clock comes with a combination of ascending sound and light simulation that starts brightening the room 30 minutes before the alarm time. As it’s the time you have set, the alarm clock starts beeping making you aware that its time to leave the bed. It features ten different light intensities and personalized setting options for you to choose from. Alongside, it also has the traditional snooze option and built-in radio that can play your favourite show right after you wake up. If you don’t need a morning shock to wake you from the bed, Philips Alarm Clock is one that will effectively manage your mood. RCA digital alarm clock is simple, affordable and reliable. It includes a simple interface with a wide snooze button that is easy to reach even when you are half asleep. The 1.4 inches LED display has clear and wide visibility with adjustable brightness control feature to set according to your vision and room lights. Unlike those fancy alarm clocks with cords, RCA is AC powered and also features a battery backup to keep working during power outages. Since it’s a simple alarm clock, with no technicalities, it doesn’t require too much of set-up and can easily be used by reading the instruction manual. This is more than an alarm clock for all the tech lovers. iHome iBT Dual Alarm Clock is cool, playful and very efficient. Its distinguishing features include the color changing cabinet that alters the colors of the clock with respect to your moods and alarm bells. It has an FM radio compatible with Bluetooth Technology that can play your favorite show from six different stations. It also has a built-in mic and speakerphone from which you can make hands-free calls. Add more to the wish-list and there is an aux-in port for music and a built-in USB charging port to keep the device charged 24/7 or charge your phone. 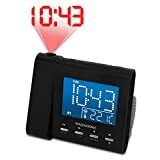 Apart from being practical and pocket-friendly, these digital alarm clocks are much more personalized and reliable than the ones where you have to set the time and alarm every night before going to bed. If you are a difficult riser and snooze button is your favorite, Sonic Alert SBB500SS Sonic Bomb will work the right way for you. If you are trying a digital alarm clock for the first time and in search of a simple alarm clock, RCA Digital Alarm Clock is good to start from. But if you want your mornings to start in a beautiful way with lights and music all according to the time and mood, Philips Wake-Up Light Alarm Clock is what you need in your room.